A fixture in the technology industry, Stacey brings to Fortinet a passion for developing and enhancing strong market leadership and creating teams that deliver results. With Fortinet's 100% channel sales model, this means providing our partners with the training, programs, relevant content and demand generation tools they can leverage to create growth and profitability for their business. Stacey supports this initiative by guiding the strategy and development behind Fortinet's global demand generation, customer-centric digital marketing, and strategic sales and partner enablement programs, ultimately delivering new pipeline for our partners. Prior to Fortinet, Stacey was vice president, marketing and demand generation at Avaya, and prior to that, she held a variety of marketing leadership roles at Symantec, most recently VP of strategic marketing and planning. Prior to Symantec, she led various product marketing teams at Check Point Software, NEC, and HP. Stacey holds an MBA from Massachusetts Institute of Technology (MIT) and a B.S. in Computer Science from San Francisco State University. We have "doubled down" on our channel marketing resources; the past year we have increased our channel marketing headcount by 100% to provide the needed support and level of quality we expect to deliver to our partners. We have spent the last year focusing on our relationship with partners to ensure we are thinking "partner-first". From our communications strategy and the development of a "best practices center" on the partner portal, to the on-going process of creating a powerful partner portal that serves as a dynamic single-source of information for partners, I have driven our channel organization to reframe the conversation. We continue to develop programs and tools that enhance partner business and make doing business with Fortinet easier and more profitable, and as the market continues to shift, I am placing a specific focus on those tools and programs that create services opportunities for partners to help customers address the cybersecurity skills gap and meet the demands of securing the expanding attack surface. We want to expand the adoption of the Fortinet Security Fabric as the architectural approach partners rely on for their customers. The Fabric offers partners a broad and automated approach to security, as well as a pre-validated integration path with multiple manufacturers so partners can help their customers maximize their current investments while limiting the "security sprawl" so many customers face. With broad and automated features, it also offers a quick path to cross-sell and upsell opportunities, so partners can drive profitability and build deeper customer relationships. 2017 Women of the Channel recipient. 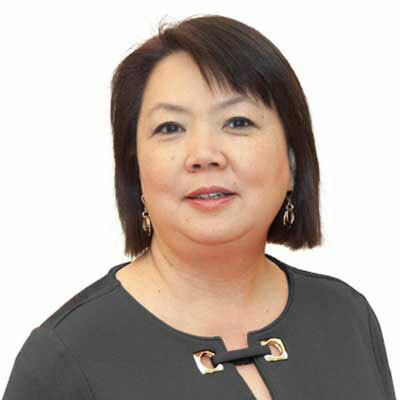 Judy Sim, Chief Marketing Officer of Oracle, sits on Fortinet board. A few interactions with her gave me the perspective of how she balanced internal vs. external demands on her time and resources, and her ability to balance the short-term business results vs. long-term investment needs. Life is full of surprises - both positives and negatives. Care appropriately and time will ease any pain. Celebrate small success along the journey, take time to enjoy the "moments". Business development - to create a brand new business model from the ground up.